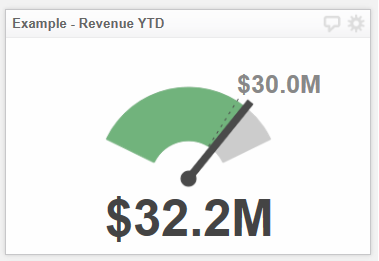 Example - Revenue YTD Klip – How can we help you today? Select the Gauge component option. Select the Create a new data source option. Delete the placeholder value 50. Select the value in cell B2. Click the ellipses ... to bring up the operator's toolbar. Select the Insert literal string option. Important: Select the following options in the Properties Panel. Delete the placeholder value 80. Select the value in cell D2. Deselect Show value on gauge option in the Properties panel. Change the value in the formula editor to 40. In the Indicators panel, click the Add button.